American River College’s 13th-inning rally came up just short as the Beavers stranded the tying and go-ahead runs in scoring position vs. Feather River College who defeated ARC by the final score of 7-6 on Friday. Feather River jumped out to an early lead by scoring an unearned run in the top of the 1st due to an error by freshman shortstop Jared Biggs. “I made an error early in the game that resulted in a run scoring and that made a huge difference in the game.” said Biggs. Errors were not an uncommon theme in this game – Feather River committed five errors, which lead to six unearned runs for the Golden Eagles, whereas ARC committed two errors. Feather River added three more runs in the top of the 2nd to push their lead to 4-0 on a bases clearing 3-RBI double by first baseman Trenton Snow. ARC didn’t let this early deficit bother them as they answered back with two runs in the 4th and one run in the 5th to cut Feather River’s lead to 4-3. ARC tied the game up at 4 in the 8th inning on an error by Feather River third baseman Keola Lutz. In the bottom of the 10th ARC was primed to win and push their overall record back to .500 at 2-2. The Beavers had men on 2nd and 3rd with no outs only needing a groundball through a hole or a medium depth flyball to send the players and fans home happy with a win. However, ARC couldn’t cash in as Feather River pitcher Jose Melendez was able to get two straight strikeouts and a popup to end ARC’s threat. Scoring runners from third with less than two outs has been a struggle for the Beavers so far this year. Freshman outfielder Micah Gunter echoed the same sentiment as Biggs. “We just got to buckle down and get the job done, I feel like once we get that big hit the wins will start coming easier.” said Gunter. Feather River took the lead in the top of the 13th by scoring 3 runs which pushed their lead to 7-4. The Beavers still had some fight left in them by starting a 2-out rally and plating 2 runs on a couple of Feather River errors bringing the score to 7-6. After a passed ball, ARC had the tying and winning runs in scoring position with designated hitter Tyler Swank coming to the plate. 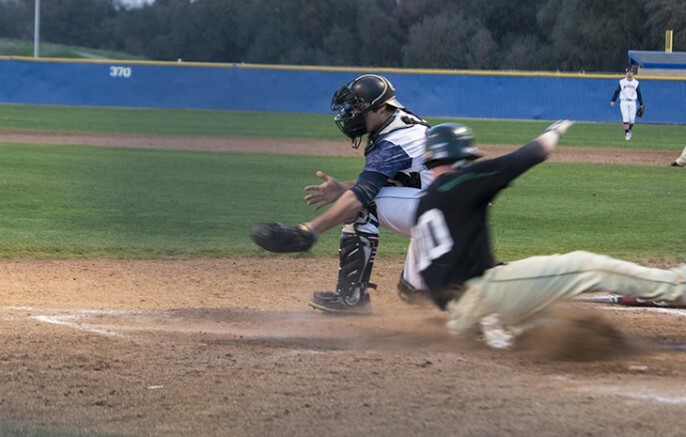 Swank smacked a ball that looked ticketed for the right-center gap, only to be caught at the last second by Feather River right fielder Peter Shearer. ARC had plenty of chances to prevail and win the game but late game execution hurt them in the end. ARC outfielder Cade Parker was still pleased with how the team performed. “We definitely competed well, I’m proud of everybody for not giving up.” Parker said. The Beavers loss pushes their record to 1-3 on the season. ARC’s next home game is Tuesday, February 9th vs. Solano College at 2:00 pm at Beaver Field. Kyle Elsasser is a first-semester student on the Current, where he serves as a staff member. He plans on transferring to Sacramento State to complete his Journalism Degree. Be the first to comment on "ARC’s baseball comes up just short in 13 innings"